In case you missed it, RadScheduler will only be available in RadControls "Prometheus"
It is also important to remember that RadScheduler will be a server control (like all other RadControls) and not a mini-application (like Google Calendar or Outlook Web Access). 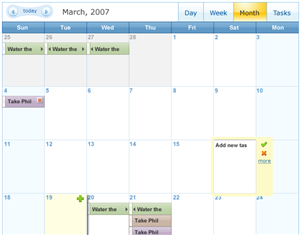 The RadScheduler component will enable you to create applications like that via rich integration with other RadControls, but it will not be a full featured calendaring application out of the box. Our goal is to make the newest UI tool in the RadControl suite flexible and powerful so developers can quickly build any kind of application they need. Watch for the preview release in late May to see the early beginnings of RadScheduler. It is unlikely that all of the features listed here will be in the May release since the control is officially targeted for Q2 (which is September 2007), but it will be a good opportunity for you to see what direction the control is taking and provide early feedback to help shape its development!